Other names for Type Seven are the Epicure, the Adventurer, and the Dreamer. There is a great deal of positive energy coming forth from our Sevens. At home in the Head Triad, they enjoy their own imaginings. Anything is possible and escapism is key. Those who identify as Sevens discover that they have lost touch with their essential “knowing” – knowing that satisfaction and fulfillment are accessed in the present moment. Instead they miss the delights of the Now to imagine something better just around the corner or off into the future. The Passion of Type Seven is Gluttony – wanting everything and more of it! More delights, more experiences… Life seems too short to take it all in. This quest to have more keeps Enthusiasts living in the future where nothing is really real. The Enthusiast’s Social Role – how they appear in the world – is that of “The Energizer.” They tend to keep things buzzing and others often think of them as the life of the party or someone who will keep things lively. Each personality type has a Wing on either side. Through self-observation, you can begin to notice which of your Wings is dominant. Your dominant Wing influences the flavor and energy of your Type. The Enthusiast will be influenced by Type Six, the Loyalist, or by Type Eight, the Challenger. Some people report being affected equally by both Wings and some people report not being affected by either. Both of these cases are rare. We do, however, find that a person’s Wing can shift at different times in life. 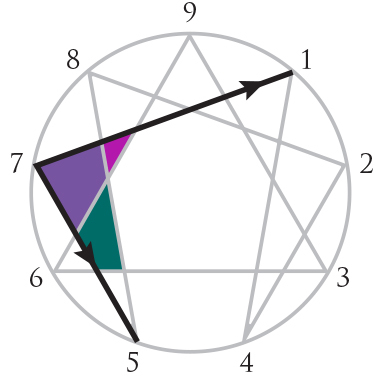 Under Stress, which can be caused by a perception that their freedom is being curtailed, Sevens will “move” to average Type One, the Reformer, and become rigid and uncompromising. In Growth, Sevens “move” in a different direction, toward a high functioning Type Five, the Investigator. They settle down and are able to focus their attention on what’s important in the moment.